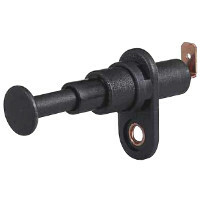 Courtesey door switch with 47mm long spring loaded telescopic plunger designed as a bonnet switch for vehicle alarms. Panel clearance 29mm. Non-corroding copper terminals and fittings.